Joseph Brant (1742 - 24 November 1807) is today remembered as one of the best known Indians of the late 18th century North America. Born in the tribe of	Mohawk Indians, he soon became a friend of several influential English military officers, who helped guide his career (most notably Sir William Johnson, who was in the relationship with the Brant's sister Molly). Although he was not a son of a Chief, he earned his title of Mohawk Chief after his successful career in the "Seven Years War" between Great Britain and France. During and after the famous American War of Independence, Joseph Brant (now a Chief of a Mohawk tribe, and a leader of Indian union of 6 tribes) became affiliated with the Great Britain. War effort brought great fame to his name in England, but also substantial infamy in United States (claims of war crimes that were later proved false). After the end of the war, he retired in Canada where he received vast amount of land from the British Empire. Joseph was born in the 1742, at the banks of the Muskingum River in present day Ohio under a name Thayendanegea (which can be translated as "he who places two bets" or "two sticks bound together for strength"). His parents were from the Mohawk tribe (descendants of old Wyandots slaves that Mohawks captured two generations ago), and according to some historians were also Christian and carried name Peter and Margaret Tehonwaghkwangearahkwa. After his father died before 1753, his mother Margaret decided to move with Brant and his sister Mary (or Molly) from the Ohio to the New York state town called Canajoharie - then famous Mohawk town that was located at the Mohawk River. In the same year, Margaret met and married Mohawk Chiefnamed Brant, whose family carried a tie with the British - his grandfather Sagayendwarahton (Old Smoke) was one of the four Mohawk Chiefs who visited the Queen Anne in London in 1710. Later on, this connection to the British Empire would be called upon to the Joseph Brant, but in reality, he had no blood relations with that famous Mohawk diplomatic mission to the Great Britain. During those years, Brant became friend with the wealthy English political diplomat William Johnson, who after several visits to his family became husband of his sister Molly. Together with his help, Brant became part of a British army. With the help of Dr. Eleazar Wheelock, Brant and two other Mohawks were brought to the school in Lebanon, Connecticut. There he proved to be of great use to several scholars. 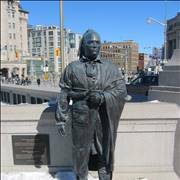 He helped to teach Mohawk language to several people, and soon became one of the interpreters for the British order of Indian Affairs. After the age of 15, Brant became part in several important military actions in Seven Years War that was fought between France and England forces. Some of his most important involvements from that time werein James Abercrombie's 1758 expedition (which was concluded with a bloody Battle of Carillon), William Johnson's 1759 Battle of Fort Niagara (where he reached the rank of Captain) and Jeffery Amherst's 1760 expedition to Montreal via the St. Lawrence River (where he took part in a siege of Montreal). For the service in this war, he and 181 of other Indians received Silver Medal. The beginning of the American War of the Independence brought the difficult situation to the members of the Iroquois League of Indian tribes in which Mohawks were one of the lesser members. In the past, Iroquois League allied itself to the England, and fought willingly in its wars against France in the Canada and US, but now England settlers in the America became separated into two warring camps. Recognizing the power of the Iroquois League, both camps wanted to gain their support. In August of 1775,Council Fire of the League was convened, and representatives from all six Indian tribes waged their decision. In the end, official ruling stated that this new war represented internal matter of Great Britain (in their wars "a family affair") and that Iroquois League will not take part in it. As with many decisions made by this council, even this decision was not honored by everyone. Under the influence of several English political and military leaders (most notably Sir William Johnson and Daniel Claus) four out of six Indian tribes joined the war on the side of England. Mohawk tribe under the rule of Chief Joseph Brant gladly joined with the Britons. Their lands were already infested with constant intrusions of the American settlers and military, and their 100-year old alliance with the redcoats promised stability and better life for entire tribe. 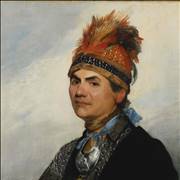 In an effort to secure his tribe's interests and to reassure English court of his intentions, Joseph Brant went to England in 1777 with the help of Guy Johnson (successor of Sir William Johnson in British Indian Affairs office). During his visit to the London, Joseph Brant met with various politicians, historians and two times with the king George III. There he reinstated his intent to ally himself and the other Indian tribes to the English cause (together with much needed three thousand Indian fighters), and in return he received a promise that after the war his people will get substantial lands in Quebec and "every support England could render them." His visit to the England greatly increased his fame. There he was treated as a celebrity and many historians remembered him as mild mannered and intelligent. 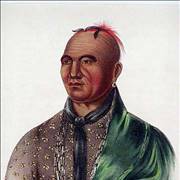 Back in United States, Joseph Brant soon became distinguished military leader and courageous warrior. Under his rule, he successfully won several skirmishes that impressed both his military peers and English politicians and ruling class. Between 1777 and 1779, he played major part in several important military moves of English army. As an Indian Chief, he gathered the support around him and joined the forces with Barry St. Leger at Fort Oswego. They together went down the Mohawk River and joined the army of John Burgoyne. During that time, he took part in the Siege of Fort Stanwix and Battle of Oriskany where he managed to stop the relief expedition of Patriots. His war actions made him unable to return to his lands, and in the winter, he remained at Fort Niagara where he planned the next course of action. After the start of 1778 spring, his forces continued to raided trough Mohawk Valley, stealing the cattle from American settlements, burning their houses and killing many. His most important engagements in that year were for sure May'sattack on Cobleskill, and September's raid on German Flatts. In retaliation to the vicious attack at German Flatts (which resulted in the destruction of over 60 houses, more than half of entire village), Coalition forces launched attack at Onoquaga while Brant and his volunteers were away on a raid. American forces destroyed the entire village, killing every Indian in sight. This event launched on the greatest Indian retaliations in the American War of the Independence. November 11, 1778, combined forces of 300 Brant's volunteers, 150 rangers commanded by Loyalist leader Captain Walter Butler, and 50 fighters of English 8th Regiment of Foot attacked the village of Cherry Valley. Death of 30 American noncombatants and over 30 captured civilians made a turning point in the relations between American fighters and Indian tribes. This "Massacre at Cherry Valley" paved the way for the famous Sullivan Expedition, who under the orders of Commander-in-Chief General George Washington went and destroyed over 40 Iroquois villages in their homelands of central and western New York. 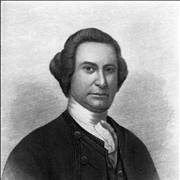 In 1779,Joseph Brantwent to Montreal where he was met new governor of Quebec Frederick Haldimand. There he received a commission from a King George III to become part of an English army, who made him "captain of the Northern Confederate Indians". In addition to the new rank, Haldimand promised regular provisions for Brant's volunteers and guarantied ownership of land after the end of the war. Although this new honor brought him much fame, he still preferred to fight as an Indian war Chief. With his new rank and riches gathered in years of combat, Brant returned to the Fort Niagara where he bought small farm. Built with the help from the slaves that he captured, this farm became his home for some time. This newfound wealth became problem for Brant, especially after several of his rival Mohawk Chief expressed their dissatisfaction (most notably ChiefSayenqueraghta). For that purpose, governor of Quebec choose not to reveal to Brant that he received promotion to the rank of Colonel. In early 1779, British army learned that American forces are gathering for the attack on the Iroquois lands (what will later be called Sullivan Expedition). Brant immediately received orders to gather his troops and explore the land at Delaware River valley near Minisink, New York in search for army provisions. 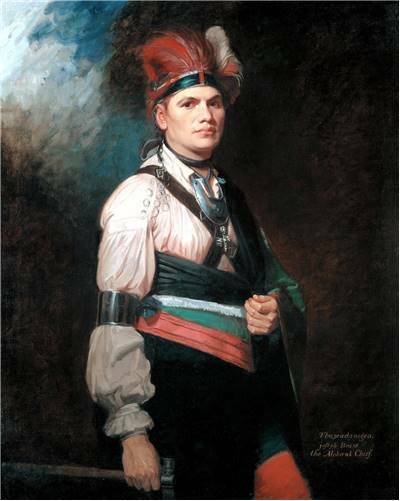 Joseph Brant successfully raided several settlements, which culminated in Battle of Minisink on July 22, 1779. American army was not contained, and toward the end of 1779 Sullivan's expedition successfully destroyed much of the Iroquois villages on their path, expelling them all from New York. Final battle between Iroquois tribes and American army happened in August 29, 1779 at the Battle of Newtown. After defeat, Indians and Joseph Brant's army retreated to Fort Niagara where they remained during the winter of 1779-80. Brant's war effort continued in 1780 when he launched bit attack on the settlements on both sides of Mohawk River. During that time, he sacked Harpersfield, Canajoharie, Fort Plank, Schoharie, Cherry Valley, and German Flatts. On October 191780, Brant received small wound to the foot at the Battle of Klock's Field, which marked the end of his Mohawk River campaign. In early April 1781, Brant was sent to the Fort Detroit, where he managed to defeat advances of American troops led by the George Rogers Clark. During that time, he was wounded in the leg and he remained in the Fort Detroit in the winter of 1781-82, while continuing his diplomatic relations to the Iroquois tribes in effort to secure their loyalty in the war that at that time started looking bad for England. In the middle of 1783, Brant finally received official orders from Governor Haldimand, which stated that he must immediately stop with the hostilities against the American army and settlements. This new enraged Brant, who tried for several months to continue the fight but was forced to abandon its cause with the lack of the English provisions. Treaty of Paris that ended the American War of Independence on September 3, 1783 brought the final blow to the entire Indian struggle. English diplomats failed to achieve their goals, and by the end, England lost the claim over the lands of the Native American Iroquois Indians, which ended the hope for Brant and his people to return to live there. When it was apparent that promises of the England toward Indians would not be fulfilled entire Indian nation became bitterly disappointed. Their entire struggle led to nothing, and many of them soon started being threatened by the invading American army and settlers. Iroquois lands in the New York were already destroyed, and their temporary settlement around Niagara Falls and Niagara fort was soon to be invaded. Joseph Brant was furious at the decisions made between England and America, stating that English King betrayed them all and sold out their lands even though he did not have right to do so. 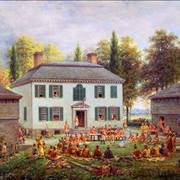 Treaty of Fort Stanwix officially brought the end of hostilities between American forces and Indian Tribes in 1784. Sadly, that same treaty forced cession of most of their land. In the America, Brant remained known for his war crimes, especially for his infamous involvements in Wyoming Valley massacre and Cherry Valley massacre in 1778. During the war, many soldiers and newspapers started calling him "Monster Brant", and stories of his atrocities became widespread across America. Today is regarded stories that were created against Brant fueled the racial hatred for over 50 years after the end of the war. It was well documented that hostilities toward the Joseph Brant resulted in the employment of several Brant bodyguards, by the order of the Governor of New York. However, several American historians wrote that during the war Brant showed multiple signs of compassion against noncombatants and captured military staff (especially highest ranked American officer in the Cherry Valley massacre, Lt. Col. William Stacy). End of the war marked the beginning of Joseph Brant's diplomatic and statesman career. He settled down on a land near the lake Ontario, where he build great house (some called it mansion) that employed over 40 slaves. By that time, he was the influential leader of the "Six Nations" of Indian tribes. As the Chief of Chiefs, he formed the alliance between the tribes of Mohawks, Senecas, Oneidas, Cayugas, Onondagas and Tuscaroras (and over 20 other Indian nations) that was called Western Confederacy. Although many other tribes elected to go with the Helman's grant, Brant's Western Confederacy remained in New York with the intent to defend Fort Stanwix Treaty line of 1768, preventing the American people to take their lands. In 1785, Brant traveled to London where he again met the English King George III. His plea of assistance was not answered in full - they gave him sizeable pension, and promised to compensate the Mohawk for their losses, but they did not provide any help in securing their lands or giving official support to their Confederacy. In 1790, Americans finally started their open warfare against the Western Confederacy in the Northwest Indian War. Although Brant refused to go into full-out war, he asked the help from the current governor of Quebec, Lord Dorchester. Sadly, England refused his help, but in the following years, they supplied arms and provisions to the Indian tribes. In 1792 Joseph Brant received invitation to travel to the capitol of America (then located in Philadelphia), where he could meet highest ranks of American politicians and the president of America George Washington. Brant tried unsuccessfully to negotiate the peace between America and Indians. The only thing he was offered were substantial monetary funds and reservation in upstate New York where he Mohawk Indians could settle. Brant refused this offer, and war continued until the defeat of the Indians in the 1794	Battle of Fallen Timbers. This loss led the Indians into signing of the Treaty of Greenville in 1795, which ended the hostilities between those two nations and paved the way of the American colonization and formation of the state of Ohio. The only Indian Chief who did not sign that treaty was Shawnee war leader Tecumseh, who continued the battle against American in following years. 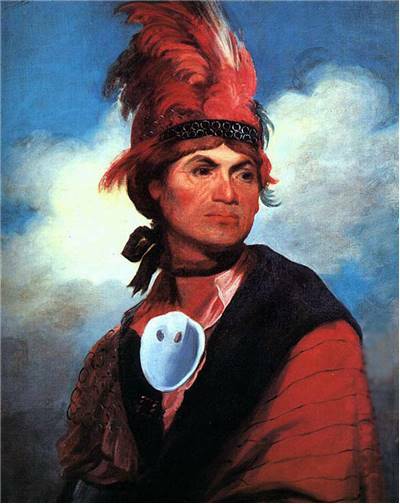 Between 1797 and 1802, Joseph Brant continued this quest to secure stable land for his nation. Some of his most notable efforts were his 1797 visit of Philadelphia where he promised to American Cabinet that his Indians "would never again take up the tomahawk against the United States", and the failed 1802 attempt of land acquisition in Ohio with the help of New York Governor George Clinton. Joseph Brant finally settled himself on 3,500 acres of land that he bought from the Mississauga Indians at the head of Burlington Bay. With the help of Upper Canada's Lieutenant Governor John Graves Simcoe, he bought that land and created a settlement where he lived until the end of his life in 1807. He died at the age of 67 in his house that is today located in the site that would become city of Burlington, Ontario. Four decades later, his remains were transported 34 miles away to the Grand River tomb at Her Majesty's Chapel of the Mohawks in Brantford, town that was named in his honor. Joseph Brant married three times during his long and eventful life. In 1765, he married the assimilated slave Peggy, daughter of unknown Virginia planters who was captured during one of the Indian raids in the mid-1700s. She gave him one son and one daughter (Isaac and Christine) before dying six years later from tuberculosis. His second wife Susanna died in 1777, and today almost nothing is known about her. During 1780, he married his third wife Catherine AdonwentishonCroghan who had bloodline connection to one of the greatest Mohawk clans - Turtle clan. With her, Brant had seven children - three sons and four daughters (his daughter Elizabeth married William Johnson Kerr, grandson of Sir William Johnson and Molly Brant, who later on became Mohawk Chief). During his life, Brant was remembered as an accomplished diplomat, great military tactician, leader who dedicated his entire life for preservation of Native American way of life, and a fierce warrior who emanated hope to his supporters and fear to his enemies. He successfully managed to negotiate diplomatic relations between many Indian tribes, most notably during the times during and after the American War of Independence in Six Nations alliance and Western Coalition. Although he was not born as a hereditaryChief, he became famous as a war Chief in the area around Mohawk River. His decisions were not always aligned with the official orders of the older higher ranked sachems and clan matrons, but his natural charisma and military knowledge, education and connections to the English politicians made him one of the most influential Native American leaders of his time. One thing that always brought him advantage to win the hearts of Indian people was his undying tendency to put loyalty to the Six Nations before loyalty to the British. Although Brant did not manage to unite Native Americans into permanent union, he paved the way for the future Indian Chiefs, most notably Shawnee leader Tecumseh who was instrumental in the formation of the great tribal confederacy that declared open war against Americans in 1810s. Today, Joseph Brant is remembered mostly in the countries of America, Canada and England, with the many statues that were erected in his honor, especially one located in the town that was built in his honor - Brantford, Ontario. Many famous portraits of him were created during his life, and his several visits to London and Philadelphia.